At the moment, UK driving licences may be used to drive anywhere in the EEA (this is the EU plus Iceland, Liechtenstein and Norway). If Theresa May’s withdrawal agreement is passed, UK licences will still be valid for visiting EEA countries. If the UK leaves the EU without a deal, then the situation gets complicated. The government will try to do deals allowing UK licences to be recognised for visits to Europe. But if it doesn’t manage to do so, then drivers will need an International Driving Permit (IDP) for all EEA countries except the Republic of Ireland. IDPs can be bought at Post Offices for £5.50. You may also need to carry your UK driving licence. There are three different types of IDP, known as the 1926, 1949 and 1968 IDPs – the numbers refer to the dates of the conventions on road traffic that established them. There will also be changes to the types of IDP you need to be able to drive in countries outside the EEA. For example, if you want to visit Turkey by car before 29 March, you will need a 1949 IDP – but after 29 March, you will need a 1968 IDP. You can find the full list of which IDP you need on this page. IDPs apply only for visiting other countries. The government has said that if you are a UK licence-holder living in another EU country, then you need to exchange your UK licence for a licence issued by an EU country, before the UK leaves. If you wait until after the UK leaves, then you may need to take another driving test. EU and EEA licenses will continue to be accepted in the UK for visitors and residents. If the UK leaves the EU without a deal, you will also need to get a Green Card from your insurer to prove your car is covered. The Green Card is only proof of a minimum level of third-party cover – it will not necessarily match the level of cover that you pay for in the UK. Check with your insurer to find out what level of cover you will get. Taking your car to the EEA without a Green Card will be against the law. The government recommends that you have a GB sticker on your car, even if you also have a GB symbol on your number plate. You’ll need to carry your V5C log book with you if you own the car. If it is a car you have hired or leased then you will need to get a VE103 form to show you have permission to take it out of the UK. Perhaps most inconveniently, if you are involved in a road traffic accident in an EEA country after a no-deal Brexit, then you may need to make a claim against the responsible driver or their insurer in the country where the accident happened. And that could involve bringing the claim in the local language. S-P-M Number Plates is currently seeking experienced external Area Sales Managers due to the expansion of our current field based sales force. The ideal candidate will be experienced in the Automotive Industry but it’s not essential. If you’re interested email your CV to sales@spmltd-uk.com. When it comes to being ready for the new ‘Trailer Plate Laws’, we leave the competition trailing ! From 28 March 2019, it will be a requirement for certain trailers travelling abroad to be registered with DVLA. When registered, trailers must display a trailer registration number plate as well as the registration number plate of the towing vehicle. 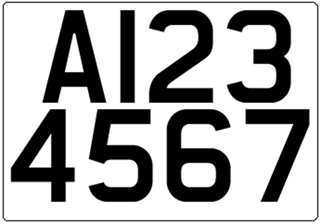 Registration plates must be supplied by registered number plate suppliers. Rest assured, we are pleased to announce that S-P-M is ready; the software on our patented Compact number plate system is already capable to produce these new trailer plates. Please ring 0113 833 0407 to place your stock orders for this new requirement, the demand has already started and becomes law at the end of March 2019. Do I need to register separately to become a supplier of trailer registration plates? No, as long as you are a registered number plate supplier you will be able to supply trailer registration plates as well as vehicle registration plates. I do not have all the necessary components to produce trailer registration plates. Where can I get them? Your current supplier should be able to provide you with the vehicle registration plate components or equipment needed to produce trailer registration plates. Is it compulsory to supply trailer registration plates? No, it is down to each RNPS to decide if they will offer trailer registrations plates. DVLA will advise customers to check with their chosen supplier beforehand to ensure they are available. Are RNPS required to keep a sales record for trailer registration plates sold? You must keep records of number plate sales for three years and show them upon request to the police, DVLA, Driver and Vehicle Standards Agency (DVSA) and Trading Standards enforcement officers if they ask to see them. A sample template of a sales record can be found on the INF195/2. THE owner of the ‘world’s most expensive number plate’ has turned down an offer of £10,000,000 for the plate. A motorist has turned down an offer for what is referred to the ‘world’s most expensive’ number plate. The registration plate says ‘F1’ and is owned by entrepreneur Afzal Khan. He bought the plate for £440,625 in 2008 from Essex Council and it is currently fit on his Bugatti Veyron Super Sport. Our friends and colleagues at Parts 2000 proudly exhibited our innovative printer system at the recent Auto Expo in Dublin. It was a great show and on behalf of S-P-M and Parts 2000 we would like to express our thanks to everyone who attended. Earlier this year the BSI published a new specification regarding Retroreflecting Number Plates with the intention being to replace BS AU 145d. The DVLA was unable to finalise the details / content in time for its pre-arranged date before Parliament. This situation means that currently there is no change to the legislation and the proposed BS AU 145e has not been implemented. Rest assured, as and when this new legislation comes into force, S-P-M’s software, systems and materials will be ready and fully compliant and of course we will update you accordingly. Once again S-P-M group were exhibiting at the European Automechanika Show in Frankfurt. This years show was our busiest and most successful to date, with several of our European Partners joining us throughout the week. Police forces in Thames Valley, Hampshire and the West Midlands are stopping motorists and immediately revoking their drivers licences if they fail a series of simple tests. Every motorist must pass the test before being allowed to carry on with their journey. It is suspected that 1000’s of drivers everyday drive on UK roads with poor eyesight. If the driver is unable to clearly read a number plate from 20 metres away they will be prevented from proceeding.